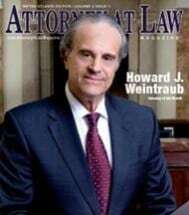 Since being founded in 1985, The Law Offices of Howard J. Weintraub, P.C., has been focused on providing aggressive, dedicated and vigorous defense services to those who are in the difficult situation of facing criminal accusations here in Georgia. When defending individuals accused of state or federal crimes, our law firm is committed to providing compassionate support, putting a high priority on frequent and clear client communication and utilizing our in-depth experience to provide the quality representation all criminal defense clients deserve. We understand how scary it can be having criminal charges hanging over one’s head and how much having knowledgeable and skilled legal support can help. The attorneys at our Atlanta-based firm have over 40 years of combined legal experience that can be brought to bear to defending our client’s rights and fighting for their future. Attorney Weintraub is AV Preeminent peer review-rated* through Martindale-Hubbell. Please contact us if you would like to know more about our law firm and our criminal defense services. National Integration Specialists Corporation, Inc.